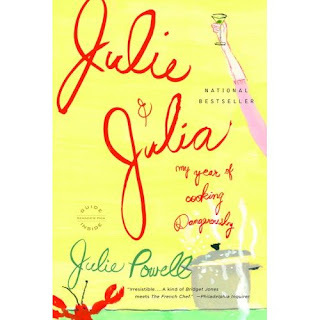 I recently finished reading Julie and Julia: My Year of Cooking Dangerously. It's a memoir-type work written by Julie Powell. At the time, she was pushing 30, working a thankless temp gig, and craving some purpose in life. She decided to attempt cooking every recipe in Julia Child's Mastering the Art of French Cooking in 365 days. She started a blog, and off she went! The book mostly recounts her misadventures in her kitchen and social life, and how the 2 are intertwined. I felt the book was mildly entertaining (it was a good way to pass the time with all the traveling I've been doing lately), but I was hoping to find more content about food and cooking. Also, I didn't think the book flowed too well, and each chapter seemed pretty similar to the previous one. Otherwise, an enjoyable and mindless read. What struck me the most was that I had a similar idea about a year ago, before I ever heard of Julie Powell! I thought it would be a neat challenge to cook my way through an entire cookbook. It would totally appeal to the systematic list-lover in me. I also like to take on large, time-consuming rote tasks for no reason (like last night when I scrolled through every single program listed in our DVR to see if I wanted to record any). I never actually went through with the grand cookbook scheme, mostly because I'm too picky. BUT! I knew without a doubt that if I ever tried something similar to what Julie Powell did, it would be with my culinary bible, How to Cook Everything, by my culinary hero, Mark Bittman. Last summer when I first started Playing House, I was cooking from HTCE all the time. When I finished Julie and Julia, I had another thought. Maybe I can cook 1 recipe per week from HTCE? Not in any order necessarily, just enough to keep me cooking in a structured way. I've been wanting to post more cooking-related content here on Playing House, so I'm going to try it! I'll start next week when we get back from LA. Now I just need a catchy name for the series... any ideas? 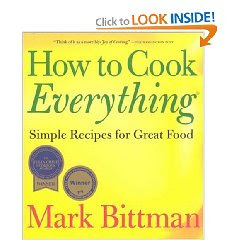 And now, the best part of this post...for all the Bittman fans out there, have you met the Mini Minimalist? Edit: For clarification, these videos are of a little kid re-enacting Bittman cooking shows verbatim. It's ridiculously adorable. I am looking forward to reading that book. I think it would be an interesting challenge. I recently read this book, too and wasn't that that impressed. Sure, it was fun, but in the end, I thought it was just too long for the message she was communicating. The concept is great, though.